This week we’ve brought you tips on how to recreate interior design themes from around the world in your home. Today we thought we’d focus on the exterior of your home. We’ve taken inspiration from the peaceful Zen of Japanese water gardens. Here are some ideas to help you create a tranquil and soothing Japanese water garden. 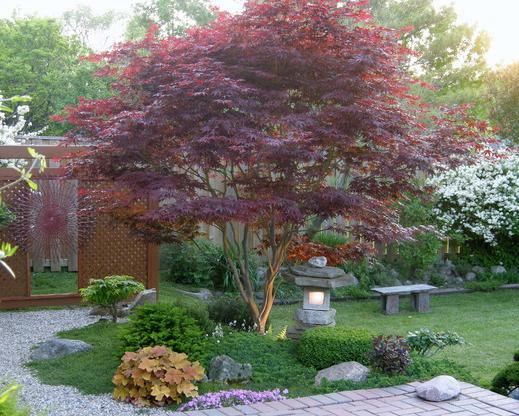 Look at this stunning Japanese maple tree, found on houzz.com. We love the colour – it looks great against the green backdrop of the garden. Remember that you can easily use plants to add pops of colour to your garden. A Japanese garden is all about making time for reflection and a calming water feature like this one from bhg.com makes the ideal setting to do just that. Check out the bamboo water fountain – we bet it looks stunning when it’s switched on. Remember when we spoke about Feng Shui the other day? Well the Japanese have their own version that is very similar. Just look at how symmetrical these plants are. The doorway gives a sense of mystery and allure, as if magical happenings go on in secret behind it. Follow these tips above to create your own serene garden space. Take a look at our home and garden section where you’ll find everything you need to create and maintain a healthy garden. For more around-the-world design tips, head over to our Facebook and Twitter pages.